Join J.D. Fischer and Rachel Quinn from the Washington State Health Care Authority as they present on the current state of Value Based Purchasing in North Central Washington and hold a conversation with local providers on what questions and supports organizations need to help them move towards delivering value based care. The presentation will cover the latest results from the Health Care Authority’s annual value based purchasing survey, provide an update on the current status of HCA’s Multi Payer Model Initiative, and talk about what both initiatives may mean for your organization. This is a great opportunity to ask the Health Care Authority questions on how this will apply to your organization and discuss what additional technical assistance may be needed regionally and for your organization to assist you to move towards delivering value based care. Presentation will occur between the regularly scheduled Whole Person Care Collaborative meeting and NCACH Governing Board meetings. Are all welcome to join, call in options available. If you have already have a list of questions you would like to ask HCA during the presentation, please send those questions to John Schapman (john.schapman@cdhd.wa.gov) by Wednesday March 20th and we will forward them onto HCA so they can be better prepared to answer your questions the day of the presentation. Agenda and call-in details to follow. 2019 NCACH Annual Summit Big Bend Community College 7662 Chanute Street N.E. It’s our largest event of the year! 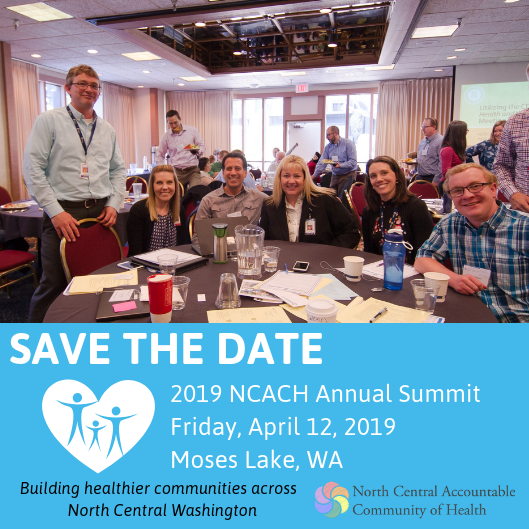 Join the North Central Accountable Community of Health for a day of learning, reflection, and action in Moses Lake. 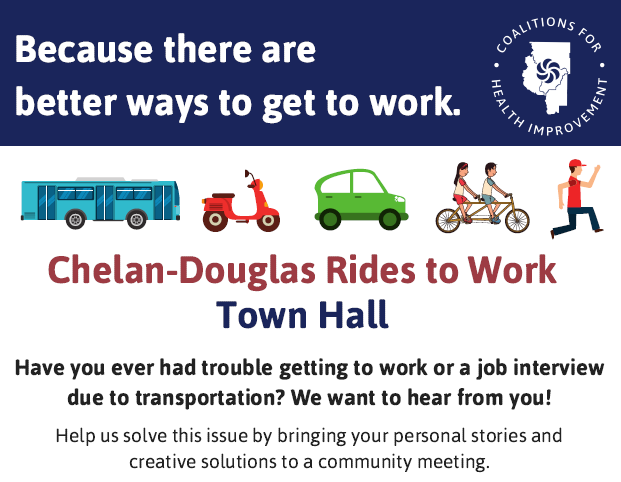 Please join the Chelan-Douglas Coalition for Health Improvement as they work to explore solutions to employment-related transportation challenges in Chelan and Douglas Counties. This event is free to attend and will feature refreshments. Please fill out this short survey about transportation solutions! The HCA will be hosting a opioid use disorder Facebook live Q&A with Dr. Charissa Fotinos and Amy Blondin on April 18 from 3pm – 3:30pm. This event is part of a larger anti-stigma campaign they are partnering with the Behavioral Health Advisory Committee on. There will be more videos (pre-produced) about recovery and reducing stigma being promoted in May and June. This will be HCA’s first Facebook live, so it’s very exciting! Facebook live is a great way for government agencies to engage with their audience in real time and provide a more accessible platform for the public to engage in, wherever they are. Please spread the word about the upcoming event to those you think may be interested in watching and participating. Anyone with a Facebook account can comment during the live to ask questions.